Adorable and functional go hand in hand! It is funny that my first post in months is going to be about measuring cups. But it is =). If you know me well you probably know that I have a little bit of an inherited obsession with kitchenware (sorry mom, I let the cat out of the bag!). I usually keep a fairly tight rein on it because I also don't care for mis-matched sets. However, Amanda made a very good point while we were baking my client Christmas goodies this year, I was severely lacking in measuring cups! Part of that is just the way that I cook. I don't measure- a pinch of this, a shake of that. However, when you bake you need to be precise. So, now I had a green light to buy a necessary tool for my kitchen! Obviously as a designer I am very cognizant of style. But most of my clients will probably attest that I am also very concerned with practicality. 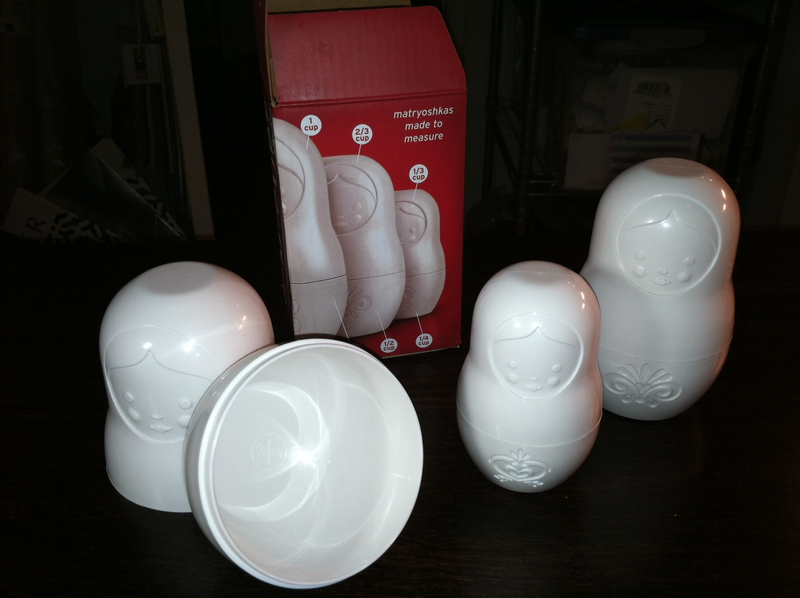 And this adorable set of nesting doll measuring cups combines those two worlds perfectly!